Our cities need homes - not safety deposit boxes in the sky. 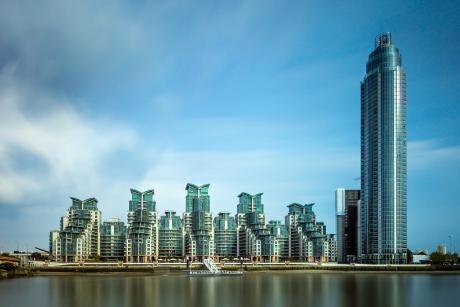 Image: St George Wharf, London 2014. James Beard/Wikipedia, Creative Commons. Housing is a basic human requirement. There’s nothing in life more fundamental than the roof over a person’s head. Good housing policies are about people rather than profit. Unfortunately we haven’t had polices of that kind in the UK for nearly four decades. In London there are currently hundreds of luxury towers going up, targeted mainly at foreign investors. They’re not homes in any real sense but financial assets, no more than safety deposit boxes in the sky. At the same time thousands of people are sleeping rough, tens of thousands of children are in temporary homeless accommodation and hundreds of thousands of them live in poverty in a private rented sector that’s broken. It’s a pattern that’s replicated all over the country. The national tragedy that was Grenfell brought into sharp focus how dysfunctional our housing system had become and finally moved housing policy back towards the top of the political agenda where it should have been all along. It’s a measure of how critical the situation is and how much lost ground we have to make up that all these many months after that horrendous fire at Grenfell only a fraction of the 200 households who needed to be housed actually have been. The rest are still in temporary homeless accommodation. But while it’s agreed there’s a housing crisis, all we’re getting from the politicians is hopeless bluff and bluster. What we need from them is a credible, practical plan of action to get us out of the dreadful mess they’ve got us into. What might such a plan look like? Ditching ‘the right to buy’ won’t cost the government any money but is long overdue. Since it recently made the miserable decision to ditch lifetime tenancies because of the chronic shortage of housing it should certainly scrap ‘the right to buy’, which did so much to create that shortage in the first place. It’s also long since ceased to be a vote winner. In fact it’s a vote loser, ‘generation rent’ having every reason to greatly resent it. After all, it’s seen the selling off at absurd bargain basement prices of 2 million genuinely affordable rented homes. When the government decided to dispose of all those council homes under the ‘right to buy’ they didn’t put anything to speak of in their place. Instead, ‘buy to let’ has resulted in 40% of those former council homes now being owned by private landlords. These landlords rent them out at four times the rents that would have been charged had they remained in public ownership. In many cases, they are leasing them back – at hugely inflated costs, and often poorly maintained - to the very same councils who were forced to sell them off in the first place, and who now have a desperate shortage of social housing to accommodate homeless people. Virtually all local authorities operate such private leasing schemes. It gets worse. Alongside the right to buy sell off, the government decided to deregulate the private rented market. This has had disastrous results ( see ‘Who Is to Blame for the Housing Crisis?’), with appalling exploitation of those on lower incomes forced to accept sub-standard housing let out by slum landlords. We have ‘beds in sheds’, ‘rent to rent,’ ‘rent a bed’. The government must not be allowed to sweep this Dickensian situation under the carpet. This sector needs to be properly regulated, no ifs or buts. Councils must be allowed sufficient funds to adequately maintain and modernise their homes. The government hasn’t permitted this for donkey’s years, and the catastrophic results predate Grenfell. They include the developer-led demolition programme in London masquerading as a renewal programme that affected no less than 30,000 council properties, and the net loss of 8,000 genuinely affordable and desperately needed rented properties. This programme has involved social and ethnic cleansing on a massive scale, with communities broken up and thousands of people displaced. And for what? So that luxury apartments could be built for overseas investors who wouldn’t even be living in them. This obscene scandal is a direct consequence of government starving councils of the funds to adequately maintain and modernise their stock, for many years. There needs to be a major drive by the government to get genuinely affordable homes of this kind built given the chronic lack of supply of such accommodation. In 2010 36,000 social rented homes were started with government subsidies. Last year just1,000 such homes were started. The government should go back to putting direct subsidy into building social rented homes by means of grant-aiding housing associations for this specific purpose. They can make a start on this by increasing their capital commitment to this back to the level it was before their austerity cuts. 5. Stop moving the goalposts about ‘affordable’ housing. The government’s failed stewardship of the land and planning system has allowed the developers to get away with two gigantic con tricks. The first is shrouded in mystery – it’s the secret financial viability assessments that developers have been using – and that are engineered to provide no genuinely affordable housing on their sites. Under this nonsensical system a major developer making colossal profits can ‘prove’ they can’t afford to provide housing of this kind on a site. The other, related con trick is hidden in plain sight. Developers and the government have colluded to shift the focus from ‘social’ housing (i.e. publicly owned property which legally must be rented at no more than 60% of market rates) to so-called ‘affordable’ housing which can be rented at up to 80% of market rates, or indeed sold in various ‘low cost’ home ownership schemes such as part-buy. The focus on affordable housing had been quietly developing under successive governments for some time. There was a greater policy push in 2014 to go down this already existing route. Then along came the Housing and Planning Act in 2016, which redefined affordable housing to include homes for sale costing up to £450,000. By this point it had become clear that the government didn’t want to put a solitary penny into genuinely low cost rented housing for people on limited incomes. They made no mention whatsoever of housing for social needs in their housing policy statement in the Housing White Paper in the following year, which says it all. The developers didn’t want to build such housing either. And the government allowed them to do this, happily permitting them to provide so-called affordable housing on their sites knowing that in reality it was anything but. This phony product was given various fancy titles (‘equity share’, ‘starter homes’ etc) and otherwise sprayed with industrial quantities of marketing bull. And hey presto, the government and the developers both looked like they were doing something to meet real housing need though in reality that contribution did little. In fact if anything, marketing this unaffordable product (many of the shared ownership versions are particularly ghastly examples) merely pushed up prices (and developers’ profits, of course) and further added to the inflationary pressures on land and property prices. While the government and the developers played this grotesquely irresponsible game of smoke and mirrors the people who suffered were the masses of ordinary people who couldn’t get access to decent genuinely affordable housing. This scandalous arrangement continues to thrive in all its hypocritical awfulness to this day. It is a complete subversion of the planning system. It is a million miles away from how it was meant to function and indeed did function until not long ago. The planning system is broken, the government broke it, and they need to fix it. Fast. This would not be difficult to do. It just needs the political will to do it. So there you have it: a five point plan with the sound rationale behind it for resolving the housing crisis. If the government doesn’t follow it or a close version of it that crisis will continue to drive the inequalities of a divided nation. If it does follow it, though, it will form a stable foundation for a public housing policy that puts people over profits and we’ll have gone a long way to becoming, as one of the richest nations on the planet, the civilized society we also ought to be.